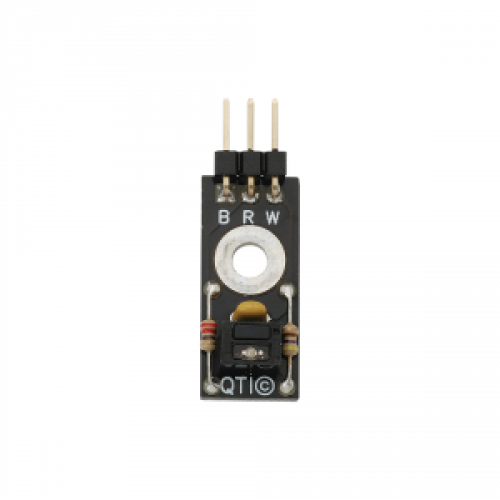 The QTI Sensor is an infrared emitter/receiver that is able to differentiate between a dark surface) with low IR reflectivity) and a light surface (with high IR reflectivity). These little sensors can be very handy for line following, maze navigation, or sensing the outer rim of a SumoBot ring. Wiring options allow it to be used digitally for fast black/white line following, or as an analog sensor to detect different shades of gray. A daylight filter is built into the sensor. What does QTI stand for? When your microcontroller measures the time it takes for the QTI's capacitor to decay, it's measuring a rate of charge transfer through an infrared phototransistor. This rate indicates how much infrared is reflecting off a nearby surface.